The same violence that has killed thousands of people in South Asia’s disputed Kashmir region is responsible for a 30 to 60 percent increase in the population of endangered Asiatic black bears, reports Toronto’s Globe and Mail. The presence of the Indian military and opposition fighters in Himalayan forests has discouraged poachers from entering the area, according to wildlife officials. “For fear of being caught by security forces, militants, or in an exchange of fire between the two, no one dares to go deep into forests since the militancy started,” said Abdul Rauf Zargar, Kashmir’s wildlife warden. Asiatic black bears are hunted mainly for their fur and paws and for the bile in their gall bladder, which has perceived medicinal qualities. Because of high demand for these items in Asia and elsewhere, the species is listed as vulnerable on the World Conservation Union-IUCN’s Red List of Threatened Species. Cross-border trade in the animals and their parts is banned under the Convention on International Trade in Endangered Species of Fauna and Flora, known as CITES. 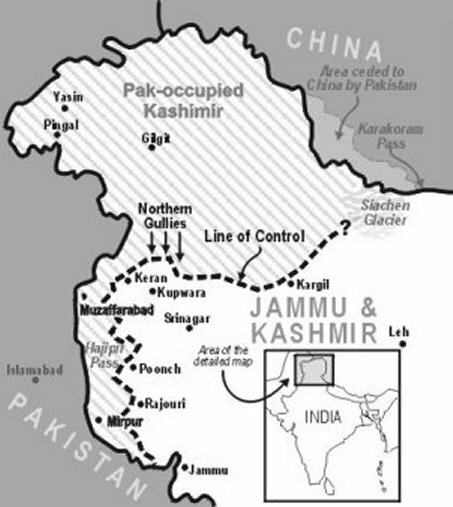 Kashmir is home to some 7 million people, but portions of the territory are claimed by both India and Pakistan. The insurgency against Indian rule began in 1989 and has resulted in the deaths of more than 40,000 people, according to official estimates. But human rights activists say the real figure could be as high as 100,000, with many of those killed being civilians. The region’s population of Asiatic black bears lingered at 800 to 900 in 1990 and has since risen to an estimated 2,500 to 3,000. Because they are now more likely to come into contact with humans, the notoriously aggressive animals pose a new threat to Kashmiri villages, and incidences of human attacks and killings are rising. In addition, the region has seen increases in populations of two endangered leopard species, the Kashmir and snow leopard. “The attacks by these wild animals on people have registered a sharp increase in past several years,” said Zargar. More than 15 people in the region have been killed so far this year by either a bear or a leopard. Some conservationists attribute this increase to the army fence separating Indian and Pakistani Kashmir, which they say is restricting the natural range of the animals and pushing them toward villages. Both the bears and leopards are chiefly solitary creatures and require large swaths of territory. In addition to these animals, other species that have benefited from the reduced poaching in the region include the musk deer, the rare Pirpanjal markhor goat, several rare and indigenous birds, and the hangul, a stag found only in Kashmir that is closely related to the reindeer. Note: This article was updated on July 27, 2007.